Many ways to get here, but the easiest for those with cars to is park up on the southeast edge of the hill, at the various scruffy parking bits beside the road at the Nick of Pendle. The view from here is enough to get you going! Walk onto the great hill up to the rounded pap of Apronfull Hill (rather gives it away really!). It’s only a few hundred yards up – about 10 mins up the slope from the road, with awesome views all round once you get there. Tis the small guidance cairn you’re looking at just on the level. You’re there! This would once have been a rather huge cairn/tomb — though when I first found the remains of this place in August 2006, there were no archaeological records describing it that I could find. But there’s very little left of it. The lads who did the quarrying further downhill (where you’ve probably parked your car) are likely to have been the culprits who nicked most of the rocks that once made this huge forgotten tomb. 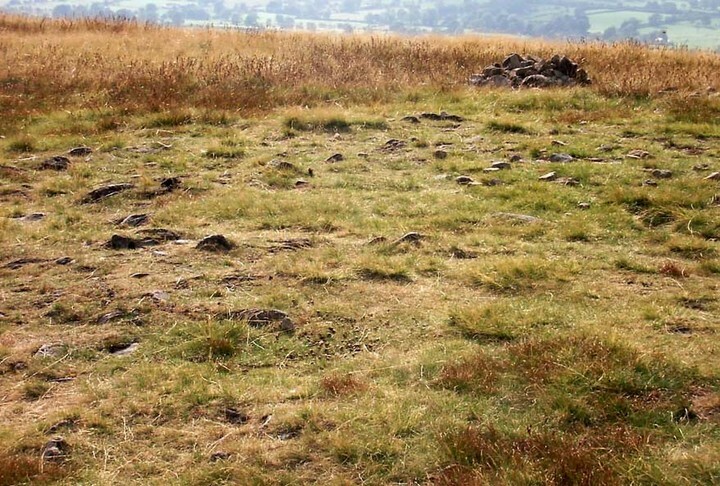 But as you potter about here, it becomes obvious that you’re standing on the much-denuded remains of just such a monument (very similar in size and structure to the more famous Little Skirtful and Great Skirtful of Stones on Burley Moor, or Black Hill round cairn near Skipton). But the remains you can see beneath your feet still give a good idea as to how large it was. You’ll see once you’re stood here that there are hundreds, maybe even several thousands of stones just on and below the ground, scattering a very well-defined roughly circular area measuring at least 21 yards (east-west) by 22 yards (north-south), right by the side of the path. The edges of this ransacked cairn are pretty well-defined around the north and eastern sides. Near the centre of the old structure is a very notable ‘dip’ in the ground where it looks as if something has been dug away — though this could just as well be due to the presence of underground water, as indicated by the growth of Juncus grasses. Without an excavation it’s obviously difficult to tell. The Devil was having trouble with the folk at Clitheroe Castle (a few miles west) and wanted rid of it. So he picked up various large stones and put them in his apron then threw them towards the castle. Most of them missed, which made him angry and in a rage he accidentally dropped a great pile of rocks on the south side of Pendle Hill, creating the Devil’s Apronful on Apronfull Hill. In another tale he was said to have stood at the Deer Stones a few hundred yards east of here and threw rocks from there. Perhaps a folk-remnant of where the Apronful stones once came from…? Perhaps not. Jessica Lofthouse (1976) notes how this old spot was long known by local people as the Devil’s Apronful. Lofthouse, Jessica, North-Country Folklore, Hale: London 1976. This entry was posted in Brigantia (Northern England), Cairns, Tombs, Tumuli, Lancashire and tagged antiquarian, antiquities, Archaeology, Bronze Age, burial, cairns, Clitheroe, creation myths, death, devil, earth mysteries, folk-lore, folklore, heathen, Lancashire, neolithic, paganism, pagans, Pendle Hill, Pendleton, prehistoric sites, Sabden, sacred sites, tombs, tumulus, witchcraft, witches. Bookmark the permalink. 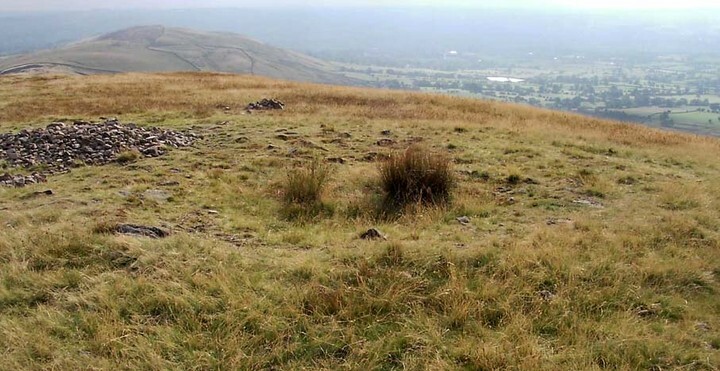 This ring of stones stands upon the highest point of Pendleton Moor by the pathway that leads from the Nick of Pendle to the summit. 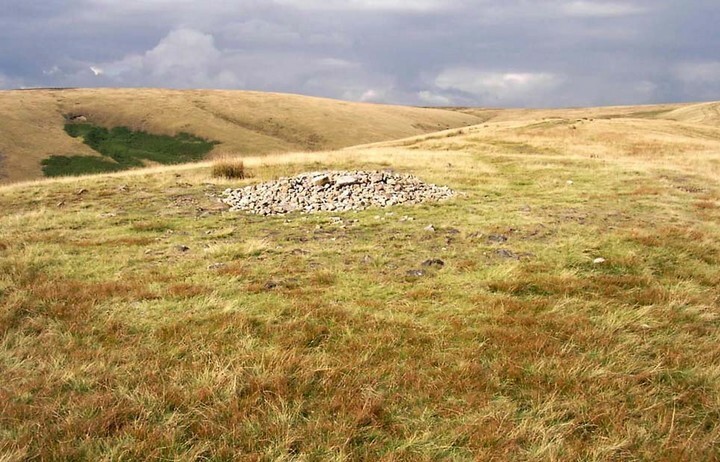 The site is now recognised as a Bronze Age ring bank cairn, a paved outer ring with a central cairn of loose stones. Due to natural erosion and the absence of the build up of peat, this feature can clearly be discerned at ground level. No excavation of the site has been made to date. 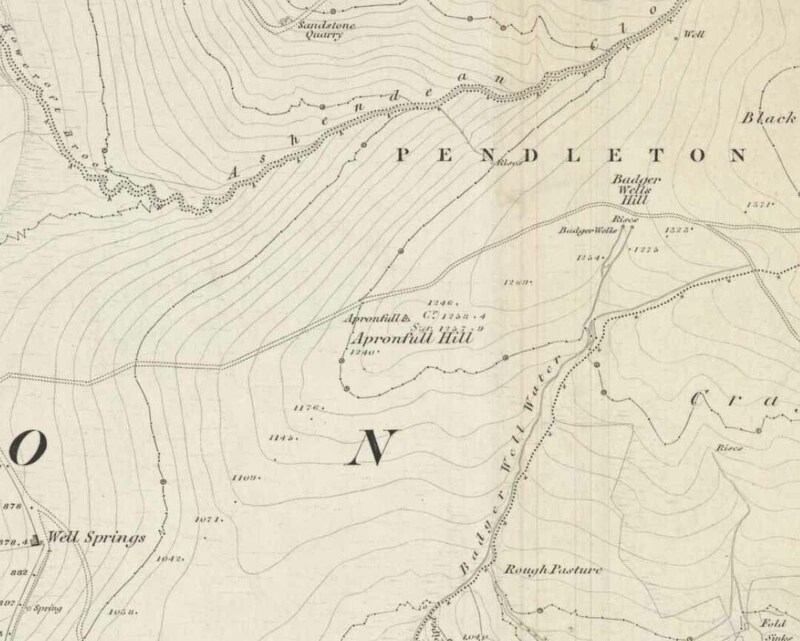 “… On Craggs Farm (now in ruin), near Sabden, on the sloping side of Pendle, is a mass of sandstone rocks that have fallen down from the scar above (Deerstones quarry). On one of these stones are two marks, side by side, about 2ft 6ins long and about 6ins wide (SD 786 393). They certainly resemble gigantic footmarks, and are said to be that of the Devil’s. ‘Old Scrat’, however, when he alighted upon this stone, he must have crossed his legs, as the left footprint is on the right side. The outline of one foot is perfect, but the other is ill-formed, which is, however, easily explained, as it is well known the Devil has a club foot. W Self Weeks, 1917. ‘Some legendary stories and folklore of the Clitheroe district.’p.86. TLCAS 34. 10 years later it’s still visible. Not as prominent as it was but still clearly identifiable. I passed my drone over it today. From the air it definitely has a defined ring around it with a centre , looks almost like an eye with a pupil. Remarkable to think after all this time and erosion it’s still here today. I believe I’ve discovered another cairn slightly lower down towards the Nick. It looks possibly like a long cairn perhaps as it’s not round or ring like. It’s a collection of stones and gravel sticking up out of the earth in a similar fashion to the above cairn. Grid coords as follows if anyone would like to investigate it.